Engineered to comply with MIL-STD 810G, new rugged COTS computers are built to resist extreme temperatures, moisture and high levels of shock and vibration. NOVEMBER 03, 2015 (SOUTH BURLINGTON, VT) - Industrial & Embedded computer manufacturer Logic Supply (www.logicsupply.com) has launched a new line of rugged COTS computers from MIL-Spec computer hardware specialists Perfectron. Intended for use in the most extreme environments, the SR100, SR200 and SR700 feature advanced passive cooling technology, as well as fully fanless and ventless enclosures to prevent contaminant ingress and create an ultra-reliable computing platform. "All of our industrial PCs are designed to resist failure due to environmental factors, but there are some projects that require a level of ruggedness that we were previously unable to offer,” said Logic Supply Product Manager JP Ishaq. “These MIL-Spec systems from Perfectron provide our clients another step up in durability and reliability. With some of the widest temperature ranges and highest level of shock and vibration resistance available, the SR Series is ideal for heavy industrial installations. Perfectron has created systems suited for mission critical applications that would quickly destroy a traditional PC, and even many of the other industrial computers on the market." At launch, Logic Supply will offer three MIL-Spec systems from Perfectron, all of which are designed to meet MIL-STD-810G for resistance to shock and vibration. The SR100 (www.logicsupply.com/sr100/) is powered by an Intel Quad-Core i7 processor and is rated for operation in ambient temperatures of -40°C to 70°C. Ideal for military, transportation, mining or other demanding deployments, the SR100 supports up to three independent displays via dual DisplayPorts and DVI-I. Other onboard connectivity includes dual Gb LAN ports, 4 USB, and COM. The system features 8 GB of XR-DIMM memory and a 64 GB SSD, soldered on for maximum reliability. With support for up to 4 1080p HD displays thanks to its NVIDIA GT730M GPU, the SR200 (www.logicsupply.com/sr200/) features an Intel Quad-Core i7-4700EQ processor, making it ideal for industrial control rooms, mobile command centers or commercial video wall applications. 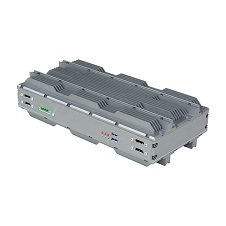 Onboard I/O includes 4 USB 3.0 ports, dual Gb LAN and DB9 serial port. Display connectivity is accomplished through four DisplayPort connectors with optional locking function. 8 GB of XR-DIMM memory and a 64 GB SSD are soldered onto the motherboard to further strengthen vibration resistance, while the SR200’s -40°C to 75°C operating temperature enables installation in virtually any environment. 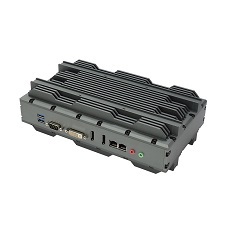 Fully IP65 rated, the SR700 (www.logicsupply.com/sr700/) represents the most rugged PC Logic Supply has ever offered. 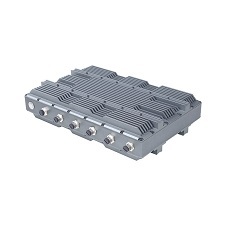 In addition to MIL-STD, water resistant M12 connectors for all I/O interfaces, the SR700 is designed to withstand vibration up to 5 Grms and shock up to 50G. Featuring an operating temperature range of -40°C to 75°C, the SR700 is engineered for installation in even the most extreme military, aerospace and heavy industrial applications. Wide input voltage, no moving parts and soldered on components, make the SR700 as reliable as it is powerful. With an Intel Haswell i7-4700EQ CPU and the QM87 chipset, the Quad-Core SR700 will easily handle a wide range of computing-intensive tasks. Each SR Series system also features a 9V ~ 36V DC input voltage range, ideal for transportation and manufacturing applications where fluctuating power is a concern. Logic Supply has partnered with Taiwan-based Perfectron to bring their range of MIL-STD systems to a new market. In addition to the SR Series, Logic Supply will soon carry the ROC Series of 1U fanless rackmount computers, featuring Intel Core i7 processing and ultra-wide operating temperature ranges. The SR Series is available now from the Logic Supply website. For more information, or to discuss specific project needs, call +1 802 861 2300 in the US or +31 85 2733760 in the EU.